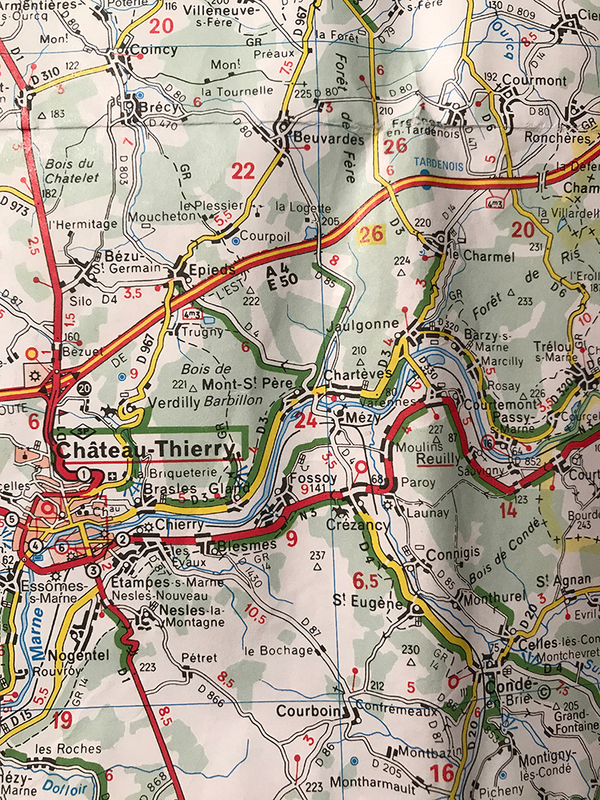 It is essential to have good maps for a self-supported tour. Be prepared to spend time understanding your route and the many nuances of navigating in a foreign country. Even if you rely on GPS units such as Garmin computers or Google Maps, you will spend a significant amount of time looking at maps. We used every type of map we carried and picked up some additional ones, too. The following bits of information are offered for those who wish to plan their own adventure. 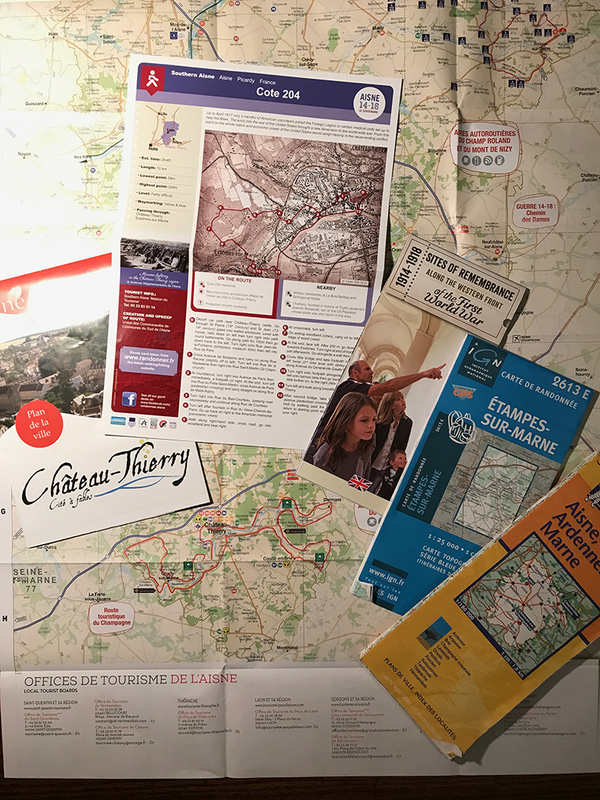 Printed maps can be picked up at tourist offices or ordered in advance. 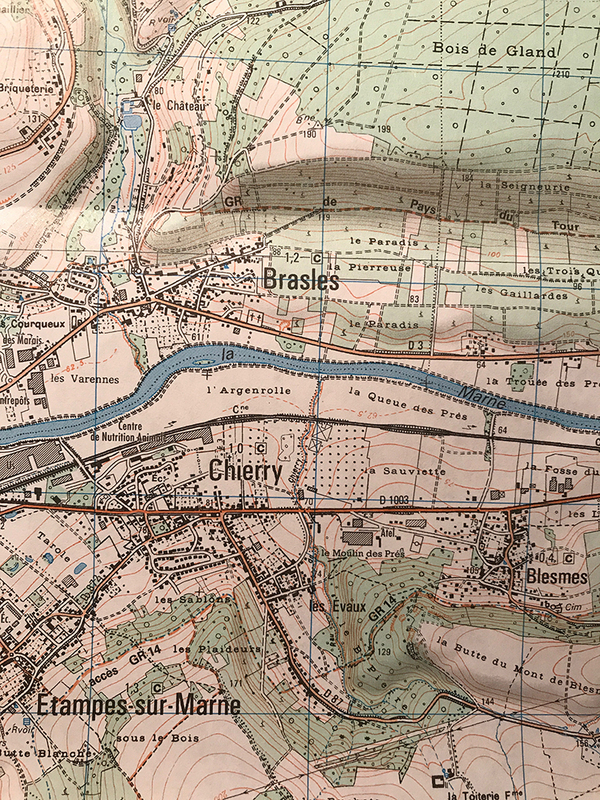 Two types of Michelin maps were handy for planning as well as navigating in real-time. 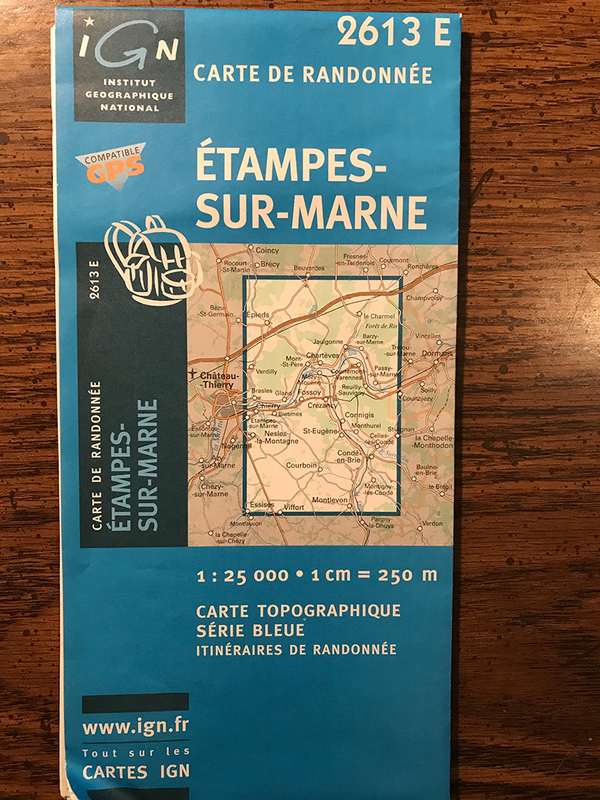 The "yellow" series Local maps and the "blue" series Carte de Randonnée (hikers' maps) offered detail on a scale that was useful for us. 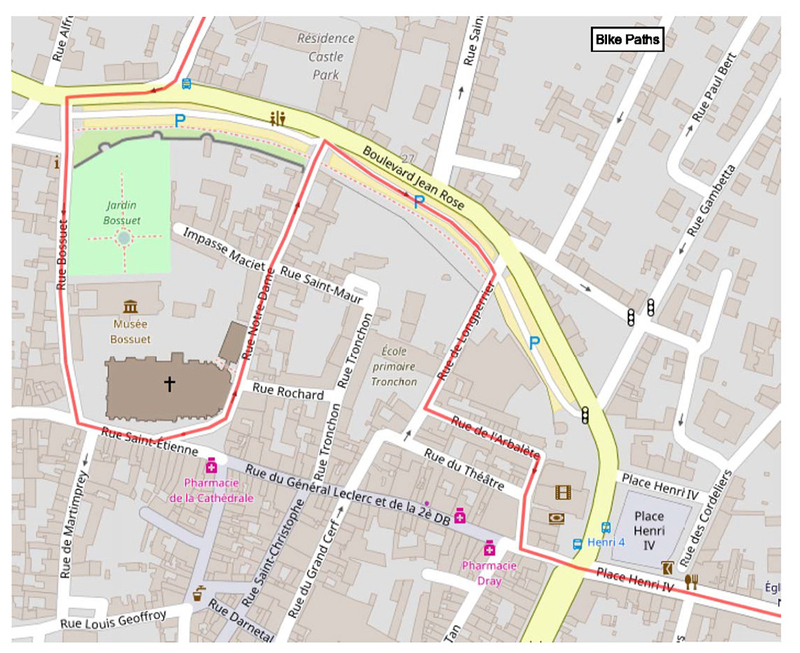 These maps can be purchased from the Institut Geographique National (http://www.ign.fr) or other vendors. 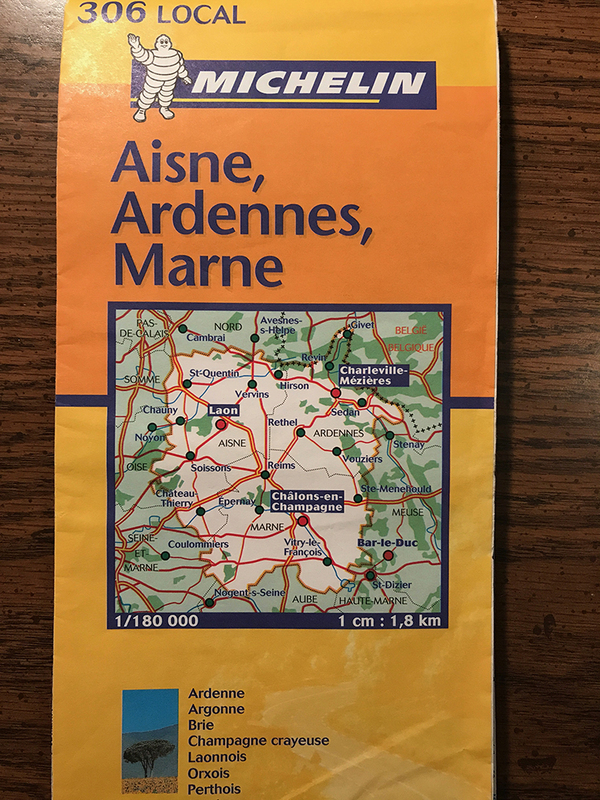 Yellow map - this one, #306, covers only the regions of Aisne, Ardennes and Marne. This is a sample of the level of detail on the "yellow" series of maps. The "blue" maps cover a smaller region but with greater detail. This is an example of the detail of a "blue" map. The best tip we got was to use the online tool, Ride with GPS https://ridewithgps.com for planning and mapping our tour. By purchasing a subscription to this tool, we were also able to save our planned routes in PDF files. The option to save as PDF includes several options to configure the map and cue sheets. You can include a profile of the route, too. We tweaked several versions of the PDF results and stored the images on our phones where we could retrieve them without needing internet accces. Subscribers to Ride with GPS can also exchange messages with others who have mapped the same region. We used this feature to correspond with cyclists who had ridden in some of the same areas we planned to go. The screen shots below are from this tool. Single-page map of Day 1's planned ride. 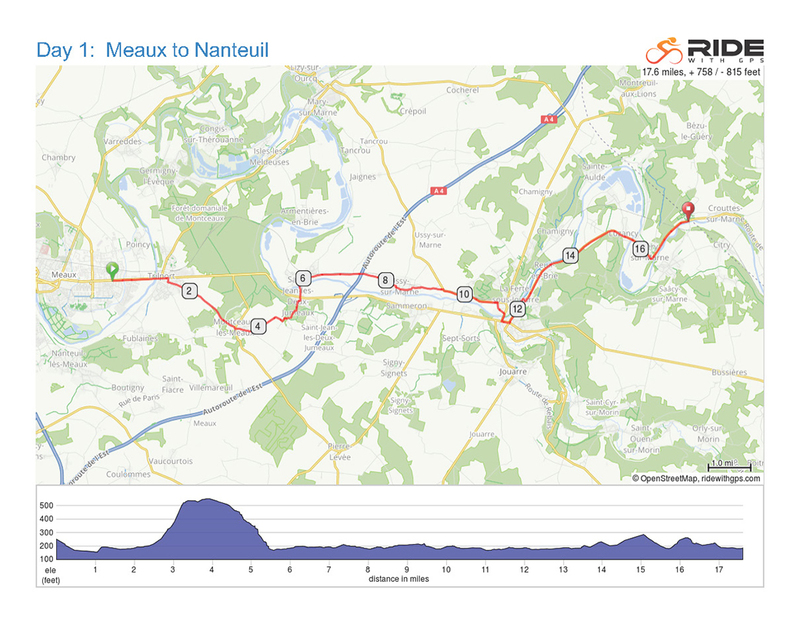 Detailed view of a portion of Day 0's ride, where we wanted more detail of the city streets in Meaux. Ride with GPS also allows us to embed a map image, so the image below is an interactive map of our overall route. You can zoom in and out with the "+" or "-" on the map, or drag your mouse pointer across the map and note the elevation profile below. Inevitably, though, you may find yourself on a trail which did not appear on any of your maps and you will wonder just where in the heck you are. In that case, we resorted to using our cell phones to consult Google Maps. We did not use this tool on a regular basis because it saps the battery of the phone rather quickly.